Filters the water. Riparian plants help clean the water running through your property. Prevents erosion. It minimizes erosion problems, especially if you plant native trees such as cabbages, it helps strengthen the land. Filters pollution. Riparian systems can carry pollutants along the way, plants help filter out most of these pollutants. At Evergreen we specialise in growing native riparian plants. We can offer farmers, lifestyle block owners or commercial clients a ‘special’ deal on these plants. Our Landscape designteam will give you good advice on the project and can create any riparian design to suit you and your property. If you need someone to construct your riparian zone then look no further, our earthworks planting and maintenance teams are some of the best around. 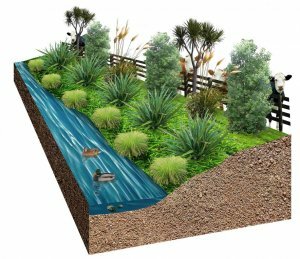 You can make sure Evergreen will construct your riparian zone to the highest of quality.